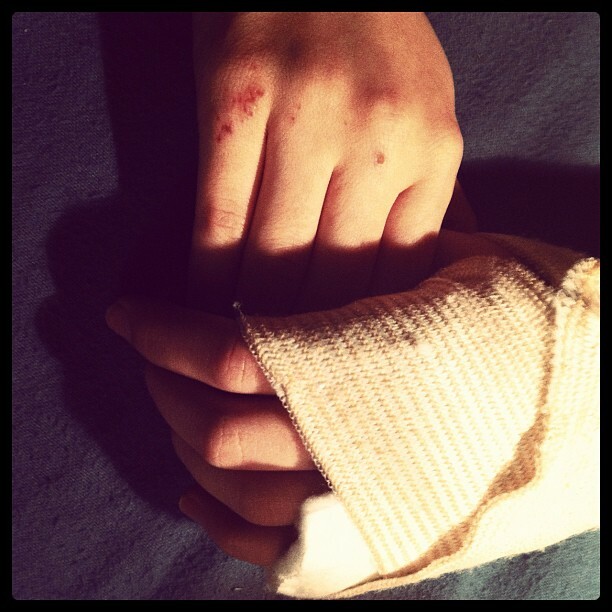 The day I broke my hand was really just like any other day. A situation with certain variables, and a resulting outcome. I needed to get to work. The skytrain was down. The busses were full. I rode my bicycle, a car wanted to pass me, and I crashed trying to get out of its way. In the first moments, I was most concerned about my head – I had hit it pretty hard, and I was worried about a concussion. I noticed blood on my hands, but couldn’t feel anything. I blacked out while waiting for the ambulance. It wasn’t until the second hour of waiting in the emergency room that I realized my rapidly swelling hand had taken the worst of it all. Two hours after that realization I was back at home in my PJs, dazedly trying to make a cup of tea with a cast on my left hand. I learned a lot of things from my month in a cast. I am a hand talker. I am someone who often touches other people on the arm or hand when I’m making a point. I like to make notes. I like to do many things at once. I was unable to do any of those things with my dominant hand folded up in plaster and tensor bandages. Instead, I had to do lots of things I don’t like, such as ask for help, do one thing at a time, and just ‘relax’. I found acceptance of only being able to hold a coffee or an iPhone at once (oh how I loathe my own dependence on technology). I met many kind and considerate strangers out in public who were intuitive in sensing the need for help (anything from tying shoelaces to picking up dropped items), and I heard lots of stories of other broken bones. I was stunned by the compassion from people with permanent injuries to their hands and feet who would talk to me out of the blue to ask how I was holding up. In the four weeks I was unable to use both hands, I had more writing deadlines than I’d had in the last year. I tried dictating to patient Arlen as he typed, but I have enough trouble getting words past my own editing faculty to put them on paper, let alone passing them through someone else’s ears first. Unable to handwrite (my right-handed cursive proving hilarious but illegible), the only option I had was typing with one hand. The rush of words and ideas came too fast and my one hand, spidering across the keyboard was too slow. I had to write. I had workshops and meetings days away and a backlog of inspiration but when I sat in front of my computer all I got was a big, chest-pain inducing, NO NO NO feeling. And it was terrifying. I survived, as we always do with these big things. I got my cast off three weeks ago now and bit by bit my hand is healing, though weaker than before. I picked up a pen right away and my WPM is back as it was before. I am more grateful than ever that words can go from heart to page as smoothly as can be again. I guess if you had asked me 2 months ago before the day the skytrain broke down if I feared something happening to me that would change my relationship with my art, that I would have understood the premise intellectually. But there’s no way of knowing what it feels like until you just can’t, until you get that NO NO NO feeling. All the while I knew I had the luxury of a date on my calendar when the cast would come off and things would be ‘back to normal’ again. I can’t even concieve of the strength of people for whom that day likely won’t come. Since then, I’ve been watching people’s hands. My mother is a clothing designer, and I don’t think I ever fully realized the amazing alchemy that happens in her studio. I bring her bolts of fabric and she stitches and pins and paints and turns out beautiful garments, one of a kind creations. I think about her hands, strong and skilled with years of expertise and artistry running from fingertip to seams. I can only imagine how many things have been made with those two hands, making something out of nothing. To help myself build back my strength, I am teaching myself to play the ukulele. I’ve never played an instrument before and so the feeling of strings under my newly callused fingertips is thrilling. I feel the years ahead of making music and taking photos and word words words I have are a gift. Just like my mom and the meters of fabric that are her medium, I know there is much to come from a pen and paper and these two hands. And pretty soon, one of these days I’ll get back on my bicycle. This entry was posted in Anxiety, Inspiration and tagged anxiety, challenges, Inspiration, playwrighting, theatre. Bookmark the permalink. Your positivity never ceases to amaze me! And I love the picture you paint of your mom, who *does* a kind of graceful dance in creating lovely things (she has always been lithe and graceful to me, the way she moves her body). By the by, your great grandmother, upon breaking both wrists falling off a platform while dancing with your great grandfather, rehabbed those wrists by knitting blankets for everyone she loved. Sometimes it hurts, but we must keep moving!